You'll learn how to create a balanced and relaxed floral arrangement, as well as the art of the bud vase. Space is limited - Sign up via EventBrite. $70 per person - Includes vessels, florals, and refreshments. Whether you're shopping for your own home, or searching for the perfect gift, fresh flowers are always the perfect finishing touch, guaranteed to brighten up the gloomiest of days. 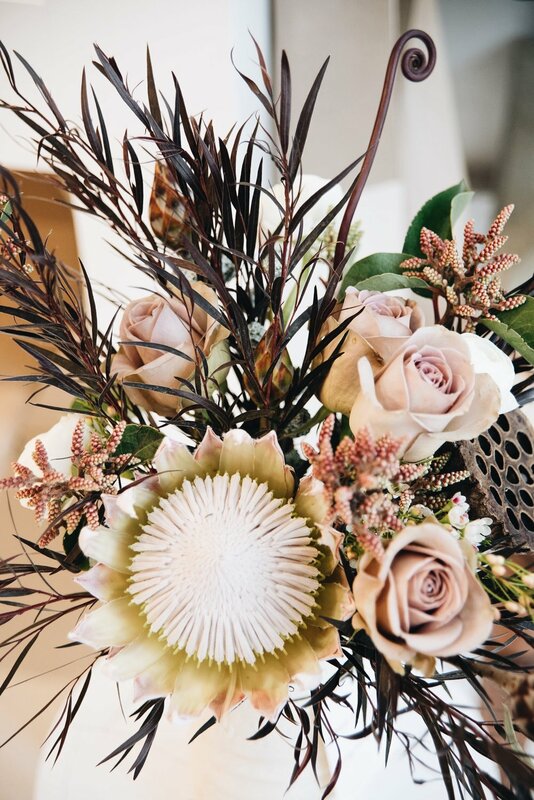 Through partnering with local floral designer, Emily Eberwine of Pick-A-Petal, we have access to some extremely unique blooms you won't find at the grocery store. A vintage bud vase with a single stem makes a great house warming gift, and a sure way to brighten any space in your home with fresh florals that don't intrude on any of your daily space. A fresh floral to greet you in the morning - what better way to start the day? A small bud vase provides a little pop of nature without invading your bed-side space. Easy to freshen up and switch out with clippings from your garden or a larger arrangement in the house. Enhance your space that you use to primp and prep each day. A little pop of color and scent among your favorite perfumes, lotions, and other daily rituals. Master bath, guest bath, whichever bathroom - a fresh hint of florals can never hurt. A bud on the left and your favorite hand soap on the right makes the whole experience that much nicer. Fresh, unique blooms provided by Pick-a-Petal are always available at Sunday Shop Wed - Sun during regular business hours.